The Double Up Food Bucks program works to help families who are receiving food assistance by doubling the amount of food benefits that can be used to purchase fresh fruits and vegetables. 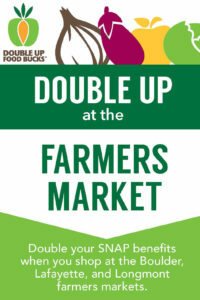 Double Up Food Bucks provide families with more healthy, fresh produce from local farmers. Double Up Food Bucks are available to recipients of food assistance (SNAP). Participants of the Women, Infants, and Children (WIC) program may be eligible for incentives at the Farmers Market. Please see below for more information on how the program works and what benefits are available. For every dollar withdrawn from a SNAP account, SNAP recipients will receive one Double Up Food Buck (up to $20) which can be used to buy SNAP-eligible fresh fruits and vegetables. Look for the information tent to get started. 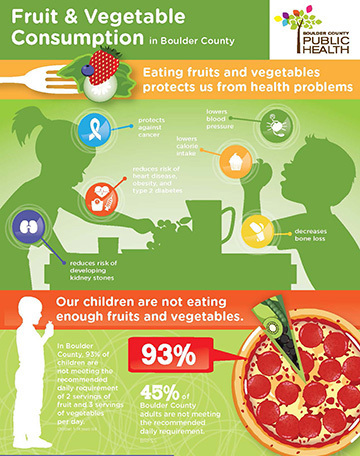 Buying your fruits and vegetables at the Farmers Market can help you and your family stay healthy. Many local farmers go to great lengths to grow the most nutritious produce possible. 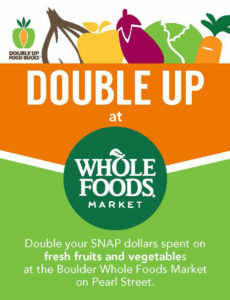 For every dollar of SNAP benefits you use to buy fresh fruits and vegetables at the Boulder Whole Foods Markets on Pearl Street or Ideal Market on Alpine Avenue, you can earn Double Up food Bucks. Put your fresh fruits and vegetables first. The cashier will total them separately and tell you how much you’ve earned in Bucks. Save the Bucks for your next transaction. Amazon Prime offers a 45% discount on Prime memberships for people who have an EBT card for government assistance (WIC, TANF, or SNAP). Whole Foods offers discounts on some items in the store to Amazon Prime members. Learn more about this discount. Women, Infants, & Children (WIC) participants can receive extra benefits at the Boulder County Farmers Market. WIC clients can receive $20 in farmers market bucks to buy fruits, vegetables, meat, eggs, and cheese. Participants can show their eWIC card with this year’s sticker at the information tent to receive WIC bucks (while supplies last). The WIC office can provide a sticker for this year. WIC benefits are available at Boulder County Farmers Market locations in Boulder, Lafayette, and Longmont. Farmers Market produce is freshly picked, in season and at its peak in flavor and nutrition. As soon as fruits and vegetables are picked they start to lose some of their vitamins. The fruits and vegetables from the farmers market ripen on the plant rather than in the store, so they keep their healthy vitamins longer. Buying from the local farmers market helps to support small family farmers. Buying directly from farmers reduces costs to them and helps them to continue growing healthy, nutritious food for our community. And supporting local farmers supports our local economy and environment. These websites offer quick and easy ways to help stretch your SNAP budget using fresh fruits and vegetables. Low cost recipes. Cooking Matters also has a mobile app that you can use to access their recipes. This site is provided by the USDA and includes SNAP-specific recipes, including the price for each meal. Get tips on preparing and storing Farmers Market produce along with some basic recipes. Boulder County Farmers Markets and Nederland Farmers Market are partnering with Boulder County to increase access to fresh, healthy, local fruits and vegetables. Boulder 13th Street between Arapahoe Ave. and Canyon Blvd. Saturdays and Wednesdays Saturdays from 8 a.m. - 2 p.m. beginning on the first Saturday in April through the third Saturday in November. Wednesdays from 4 - 8 p.m. from the first Wednesday in May through the first Wednesday in October. Lafayette E. Simpson St. between Iowa Ave. and Michigan Ave. Thursdays Thursdays from 4 - 8 p.m. from the second Thursday in June through the fourth Thursday in September. Longmont Boulder County Fairgrounds at 9595 Nelson Rd. Saturdays Saturdays from 8 a.m. - 1 p.m. from the first Saturday in April through the third Saturday in November. Winter Market on first Saturday & Sunday in December from 9 a.m. - 3 p.m. Contact the Healthy Food Access Coordinator at 303-441-1330 or contact us online.